Tiny Pine Press has been working with the Joyful Heart Foundation for a few years now, designing and printing invitations for some of their events in New York and recently in Los Angeles. The Joyful Heart Foundation’s mission is to heal, educate and empower survivors of sexual assault, domestic violence and child abuse, and to shed light into the darkness that surrounds these issues. Since I have really gotten to know the organization over the years, I realize that what they do is truly focus on spreading JOY in the present and for the future and not focus too much on the negativity of experiences. I designed and created these cards with the same intentions. I wanted to create something that represented the Joyful Heart mission from a pure place…. something that someone would be so grateful to send and grateful to receive. The result was that I was grateful to create them. I haven’t done a line of cards before like this. I cut all the paper (with my new cutter!! ), printed two runs on 650 cards, watched Cheryl score them….. (my hand was hurting from the 1300 previous pressings) had some extremely helpful hands with the rhinestone gluing (thanks CHERYL and JILL! ), packaged them for gift bags on a Friday night (thanks Joanna), AND I loved every minute of it. I felt joy and love in this work. What’s amazing about gratitude is that if you truly feel it, your heart opens up and love comes flowing right. 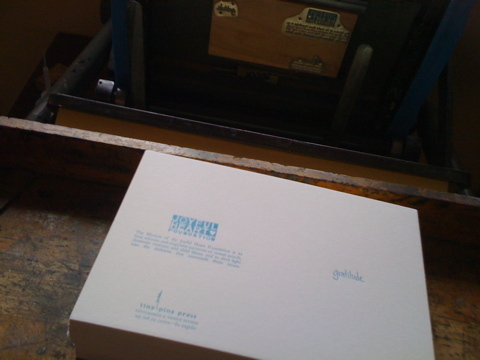 Sometimes it lands on the ink disk in the form of soy ink and gets printed on luxurious cotton. 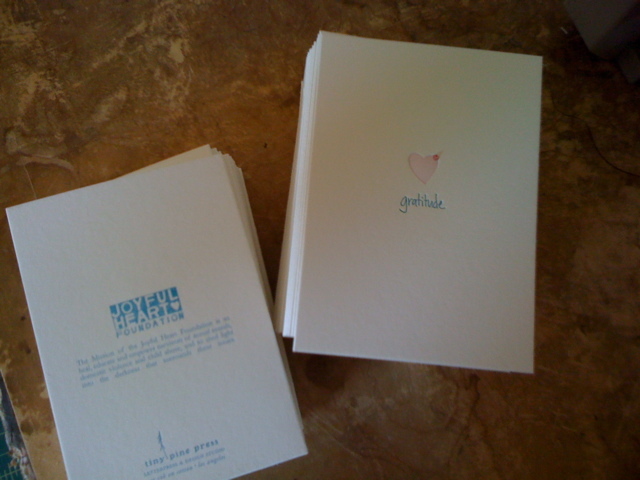 This entry was posted in art, paper, printing, tree free paper, Uncategorized and tagged joyful heart foundation, Letterpress, printing, soy based ink, tiny pine on January 30, 2010 by tinypine. is my treasure! especially in this case. Introducing my new big bad printing giant. 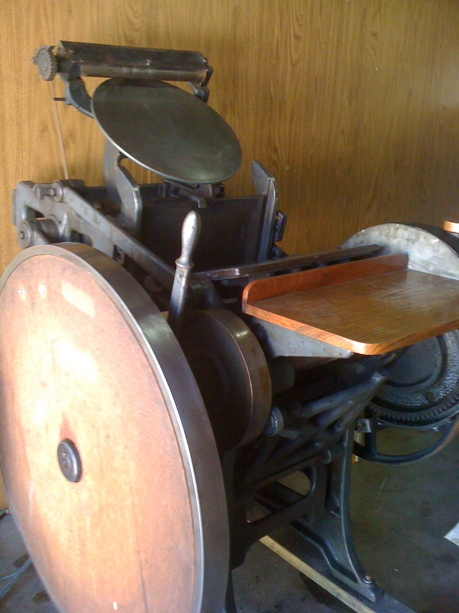 He’s a Chandler & Price 10×15 old style from around 1912. He is OLD and sweet and so far his personality is easy-going. He still hasn’t told me his name. I do know that he is a loving gentle giant. His heart is open and exposed because look what I found. He has an ink fountain attached and the pins are shaped like little hearts. A whole row. I saw those and fell in LOVE! I parked him in my garage with his girlfriend, the big cutter. I think she told mentioned that her name is Betsy. They are about the same age and they came from the same shop. I just couldn’t bear to separate them. Betsy doesn’t look her age, but she is set in her ways. Photos of her are coming shortly. I have been spending extensive quality time with my new friends, just getting to know them…. 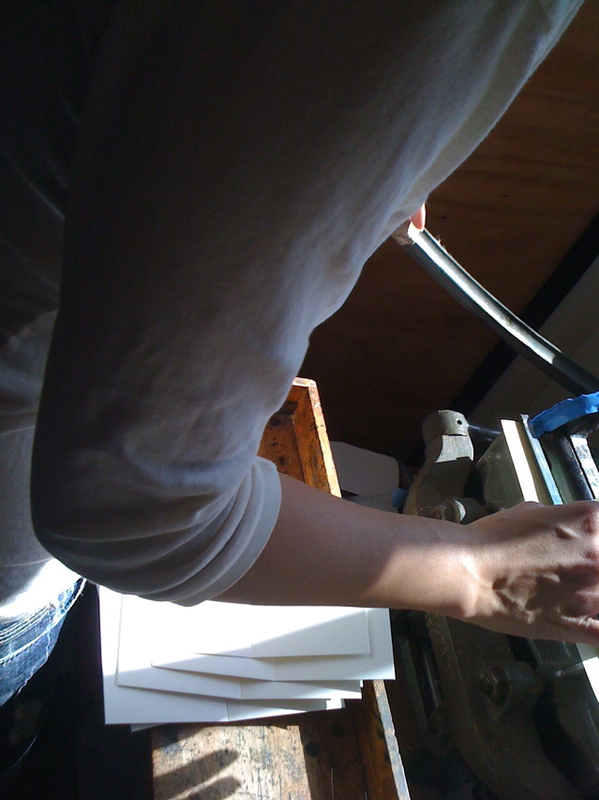 Cleaning up the quiet Mr. printing press and trying to listen for his name – exploring all of the possible ole holes for his old joints. 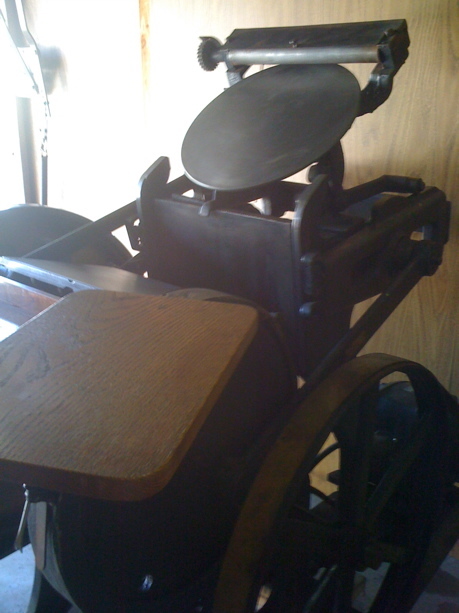 and getting ready to have the chiropractor come over soon to give him an adjustment so he will be ready to print print print. This entry was posted in art, family, printing and tagged Letterpress, Los Angeles, printing on January 13, 2010 by tinypine.